As clients of Briarcrest Vet Clinic know, Dr. White and his staff frequently go above and beyond the call of duty to care for all kinds of pets, often whether the pet has an owner or not. Pattycake is a young, feral, domestic shorthair cat, which Briarcrest staff member Diego's sister, Stella, had been feeding in her apartment complex. 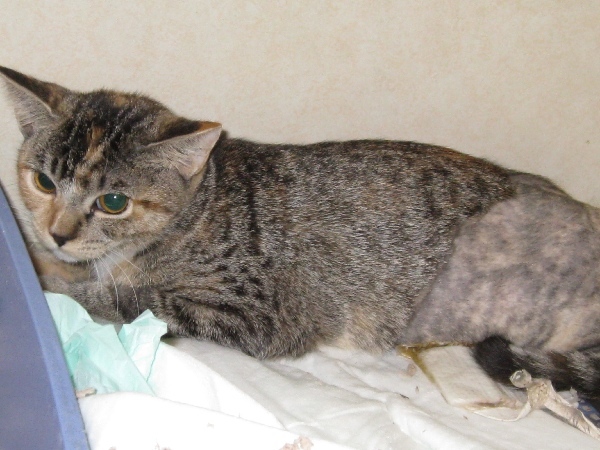 On August 15, 2011, Pattycake was struck by a car and her pelvis was crushed. Due to her fractured pelvis, she could not walk on her back legs. So, she had to drag her body to Stella's apartment patio, where she knew she could find help. She was in extreme pain and panting due to the high temperatures outside. They brought Pattycake to Briarcrest, but her injuries required surgical procedures that the clinic was not equipped to handle. Unwilling to give up on Pattycake, she was taken to Sugar Land Veterinary Specialists. On August 16, 2011, their veterinary orthopedic surgeon performed surgery to rebuild Pattycake's pelvis, including some new metal parts. Briarcrest Vet Clinic incurred great expense to save Pattycake and cover her recovery/rehabilitation. For this reason, the "Pattycake Fund" was established and through it, funds were raised to cover Pattycake's expenses. Now we are asking those who have been blessed by the clinic's care, as well as those who would just like to help, to please help us with rescue expenses like this, so that we can continue to help other pets in need. Please consider making a donation to the "Pattycake Fund" to help pay for veterinary expenses for pets like Pattycake and to express your appreciation for the efforts of Briarcrest Vet Clinic. Donations may be made by clicking on the Donate button above, mailed to the clinic, or placed in the donation box at the front desk of the clinic.